Danielle was born and raised in Wisconsin. While attending High School, she enlisted in the United States Air Force. Upon graduating Basic Training & Tech School, Danielle’s first assignment was Tinker Air Force Base in Oklahoma. After 3 ½ short years, she was medically discharged in 2007 but left with many awards and accomplishments. Shortly after, she began her financial career with Midfirst Bank in the mortgage and loss mitigation areas. She joined the T.S. Phillips team in 2009 as an Operations Associate. 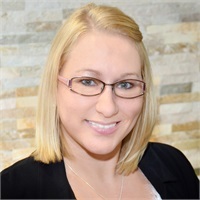 In 2013, Danielle took an Office Manager position with another company that was closer to her home in Shawnee. During her time away from T.S. Phillips, she was able to be with her husband, who was battling cancer at that time. Four years later, Danielle rejoined T.S Phillips as an Administrative Assistant to Tom Phillips. Danielle, her husband, Shaun, and their children reside in the Shawnee area. Their hobbies include boating, racing cars, attending car shows, having cookouts, helping others, traveling, and watching their children play sports.